Sending gifts to Hermosillo online has become simple now. You can order to send gift baskets, hampers, corporate gift, fruits, chocolates, wine n more gifts to Hermosillo with quick delivery options. Order your choice of basket for Christmas, anniversary or birthday. We shall ensure delivery on time every time. We always ensure, elegant to look at and beautiful to hold, our hand-packed gift baskets are filled with high-quality gourmet foods, wines, chocolates and even fresh fruits. 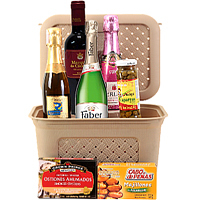 When you send a gift hamper to Hermosillo through us, you are sure to surprise and delight the recipient. A great gift basket is a true reflection of your taste and style. It reflects how you feel about the loved one you're buying it for. Browse our classic selection of gift hamper, gift baskets and assorted gourmet food gifts for delivery in Hermosillo and you will be amazed. Order online to send gifts to Hermosillo for all occasions like birthday, Christmas, anniversary, wedding or more. We shall deliver it all. We also offer food gifts that fit every occasion including specialty baskets with fruits, tea, spa, chocolate, wine, meat and cheese.